This is our most popular range of tables and chairs originally designed by Thomas Hawson and Darren Barclay. We have been making these chairs and carvers exclusively for private, public and corporate clients for 18 years. All handmade in local hardwood such as elm, oak, ash, beech and sycamore. Occasionally in alder or cherry when we have some through our kilns. We make the award winning Teviot chairs, carvers and tables to order. These are designed, made and finished to your specifications. Our clients tend to go for the fabric upholstered version for dining rooms and kitchens but we have made solid sculpted seats or leathers. In the case of fabric and leather we only use Scottish sourced materials and hides. Supply of your own fabric is also an option. 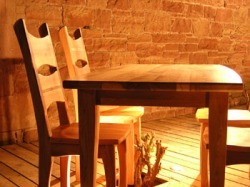 This is one of the most solid hardwood chairs and table set you will come across. Every Reiver chair is sculpted and made by the makers in the workshop. No two sets are the same and that's what our clients like. 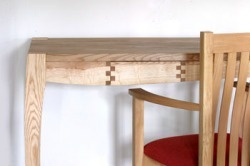 Usually elm or ash is chosen for the frames and seats. The two back splats can be made and curved to sublime lines. These chairs were originally designed by the late Tim Stead and Neil Robinson when we first started up the workshop in 1996. The table that complements the chairs originally designed by Stuart McKinven and Barney Miers is made in the workshop in Jedburgh. The curved legs and top results in a flowing range ideal for a busy kitchen or conservatory spaces. This bespoke range evolved through our designer makers addressing the use of small girth local hardwood from the Scottish Borders. That's why the tables, benches and stools are a visual treat for admirers of grain, colour, texture and all the beauty that is to be found in our native timber. The benches can be made to fit below the table and we have made small end benches for the full package. Stools originally designed by Thomas Hawson are quirky and unique to this Borderline range. The assemblage of different timbers and they way we construct the contemporary furniture lends itself to worktops, cabinet doors and other small product.